Are juice cleanses the new, socially acceptable eating disorder? Marie Claire thinks they might be. Quoting numerous sources whose own disordered eating was enabled by juice fasting and dietitians and doctors who have noticed a big uptick in eating disorder patients who talk about juice fasting as a focus of their disease, and drawing attention to the skeevy marketing tactics of the companies that are pushing juice fasts, the piece is a little alarmist. But not, perhaps, entirely off the mark. Marjorie Nolan Cohn, a registered dietitian and nutrition director for Metro Behavioral Health Associates, an eating disorder treatment center in New York, points to the country's current food climate as conducive to cleansing. High-profile books and documentaries—likeFast Food Nation, Food, Inc., and Michael Pollan's entire oeuvre—have heightened consumer skepticism of processed food, chemicals, and pesticides. That's great, but it makes "the idea that you're releasing toxins an easy buy-in," says Cohn. "If you have a type A personality, a cleanse brings on a euphoric, overwhelming sense of control." Anorexia and bulimia are diseases of control and obsession; it's not hard to see that the structure of a juice fast would necessarily appeal to a person who is predisposed to eating disorders. And while refusing food for 3, 5, or 7 days at a stretch would raise eyebrows in most workplaces and social groups, saying you're on a "cleanse" gives you a pass. No wonder whole offices do juice fasts together. Juice is made of fruits and vegetables. Fruits and vegetables are healthy. Juice is healthy! Juice fasting has to be healthiest. 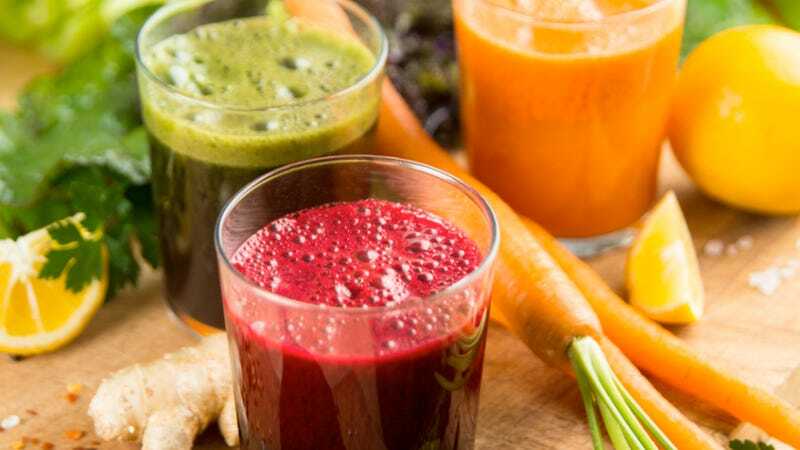 Never mind that juice lacks essential nutrients, including fiber and protein, and dietitians seem to agree that most people would be better off just eating more fruits and vegetables than buying pricey juices from a prepackaged "cleanse." There was a very interesting article about fasting in Harper's last year. Not juice fasting — straight-up water-and-no-food just fasting. The author, Steve Hendricks, writes about the medical and cultural history of fasting, tracing a waxing and waning belief in the curative power of fasting from the ancient Greeks through the Victorians through the early 20th Century, when medical studies apparently found periodic short-term fasting had positive results for patients with epilepsy and Type I diabetes. Though in the course of the piece the author undertakes a 19-day fast with the explicit stated purpose of losing around 30 lbs, which he does, the article contains no discussion of eating disorders, body image, or how the cultural pressure to be "healthy" is most commonly expressed in the overwhelming pressure to be thin. It's a curious oversight. When I read first read the piece, I remember thinking that all those thousands of words on the purported benefits of periodic short-term fasting — Hendricks talks of cancer and chemotherapy, of Gandhi, of Socrates and Plutarch and auto-immune disease and mental clarity — seemed kind of, well, irresponsible insofar as it could serve, to those predisposed to a disordered relationship with food or an obsession with dieting and control, as an enticement to a dangerous kind of experimentation. Hearing other people rave about their juice fasts — how much energy they have! how good they feel! how they're not hungry at all! — awakens in me a similar fear. I actually rather like vegetable juice. There's a place a few blocks from my apartment run by a couple Jamaican guys — my personal theory is that Rastafarian juice bars > all other juice bars — and I might even stop by there this afternoon because all this thinking and writing about juice has me wanting some. I stayed at a friend's apartment for a week last December and I used her countertop juicer almost every day. I think juice, though high in sugar, can be a part of a balanced diet. It's a "sometimes food." But I get uneasy whenever a friend tells me — and this happens with increasing frequency — that juice is all she's consuming. Talk about "toxins" and "cleansing" and "good" and "bad" foods just seems unwholesome — just another way of talking about elimination and control. Two things that don't have much of a place in a well-ordered relationship with food. I wouldn't go so far as to say, as some of the sources in the Marie Claire piece do, that juice fasts are like a gateway drug to anorexia and bulimia — but I can't shake the suspicion that they're not completely healthy, either.